Generally, data restoring over network is very much the same as that on a local computer. R‑Studio Agent should be running on the network computer where data are to be recovered. Read the Connecting over the Internet topic to learn how to establish connection between R‑Studio and R‑Studio Agent over the Internet. 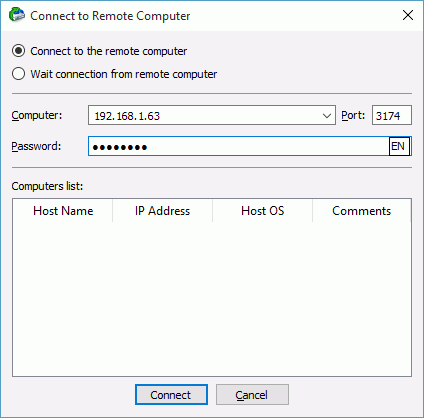 A list of nearby computers will appear in the Computer List on the Connect to Remote Computer dialog box. Otherwise, you need to specify in the Computer: field the name or IP address of the remote computer where data are to be recovered. The Port should coincide with the port specified for the R‑Studio Agent . The Password: field is for the password of R‑Studio Agent running on the remote computer. If you want to see the entered password, right-click the field and select Show password on the shortcut menu. Note: If the remote computer is started with R‑Studio Agent Emergency , leave this field blank. It can be processed the same way as that on a local computer. 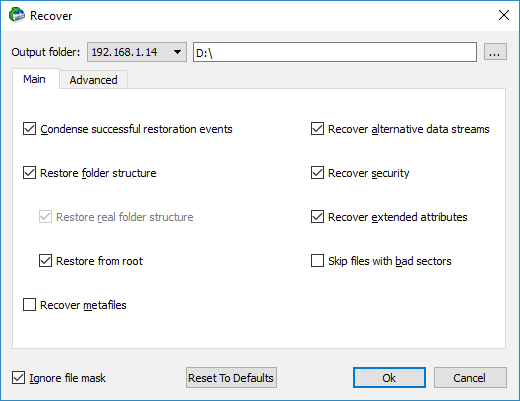 When the Recover dialog box appears, you may select whether you want to save recovered files on the local or remote computer. Saving recovered files on a remote computer may be useful when the remote computer has a healthy disk because you do not have to transfer files over network. It may be an external USB hard drive, for example. When R‑Studio connects to the remote computer, it check if R‑Studio Agent is present and its password. If there is no R‑Studio Agent installed, R‑Studio may try to remotely install it. See the R‑Studio Agent topic for details.